Cloudy. High 54F. Winds ENE at 10 to 15 mph.. Partly cloudy skies. Low 36F. E winds shifting to SW at 10 to 15 mph. Call it summer camp for adults. A week away from the hustle and bustle of day-to-day life may be the cure to the summertime blues. In addition to guided activities -- such as yoga, horseback riding and meditation -- retreats often provide time for self-reflection and fellowship. This retreat helps writers connect with horses and provides creative inspiration. Explore what life looks like through the eyes of a horse through horseback riding. 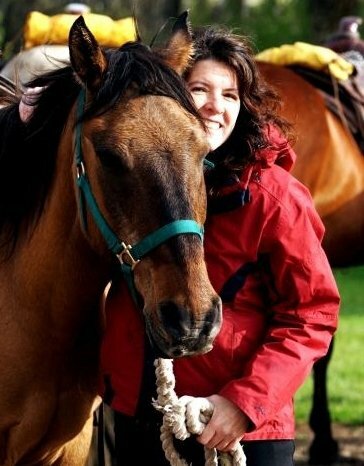 Equestrian Sheri Griffith and Vee Bar Guest Ranch wranglers will guide horseback rides. Each participant will be assigned a specific horse for the duration of the retreat. Those who attend will learn about horses, their instincts and environments, as well as themselves as writers. Author Page Lambert will lead literature and writing workshops. She is a founding member of Women Writing the West, a nonprofit association of writers and other professionals writing and promoting the Women's West. Accommodations: Shared cabins or rooms at Vee Bar Guest Ranch, which is located 20 minutes west of Laramie. The log cabins are a short walk from the main lodge and have gas fireplaces, bathrooms, coffee machines, small refrigerators and hair dryers. Rooms are available in the Riverside Suites, a rustic, historic lodge with modern conveniences. It is located near the lodge and hot tub. Cuisine: Meals may be served family-style or buffet-style and include fresh bread and pastry, meat, fresh fruit, fresh vegetables and desserts. Water, coffee and pop will be available throughout the day. What to bring: Long pants and cowboy boots; comfortable walking/hiking shoes; a swimming suit for the hot tub; camera; layered clothing (sweatshirts, fleece, long-sleeved shirts); warm jacket (rain slickers are provided); sunglasses; brimmed hat; scarf and gloves (the weather can change quickly). Writing journals and all tack and gear are provided. Enjoy healthy living the Western way, with daily yoga, massage, guided hikes, strength training and cooking classes. A working dude ranch, Red Rock Ranch also offers fly fishing and horseback riding. Yoga is led by Margaret Burns Vap, founder of Cowgirl Yoga and Big Sky Yoga Retreats in Bozeman, Mont. She will teach yoga twice daily, focusing on vinyasa flow and restorative yoga. Participants can take part in other activities offered at the dude ranch during this annual event, and the ranch's kids' program will also run at that time. Accommodations: Shared log cabins at Red Rock Ranch, which is located 26 miles northeast of Jackson in the Bridger-Teton Wilderness. There are one, two and three-bedrooms cabins with a variety of beds to accommodate families. Each cabin has a wood stove, a large sitting room, a bathroom, electric heat, refrigerator and sun porch. There are daily housekeeping services. Cuisine: Meals are healthy with a Western flare. They are served family-style, buffet or plated dinner service in the main dining room. Snacks are provided and complimentary wine and house beer are served during nightly happy hours. What to bring: Jeans and slip-on, low-heeled cowboy boots for horseback riding; a jacket and sweater; sunglasses; comfy clothes for yoga (mat provided); a hat with a chin strap; sunscreen; camera; fly fishing gear, if you'd like to use your own (Loaner rods are available and flies can be purchased at the gift shop); hiking shoes; alcohol, if desired outside of cocktail hour. Find clarity and the confidence needed to make changes in your life during this spiritual gathering. Noorah Hansen, who has 20 years of experience as a wilderness guide, will lead the retreat. She owns EarthSpirit Services in Mt. Shasta, Calif., through which she provides coaching, seminars and workshops in communication and success with a focus on empowering women. During the retreat, she'll lead three- to four-mile hikes daily and meditation each morning and evening. While self-reflection is a major aspect of the retreat, attendees will also have the opportunity to express themselves, let nature relieve their stresses and enjoy the beauty of the landscape. A boat-ride across Jenny Lake is included. Cuisine: Cook your own meals in your room. Vegetarian groceries are provided. Bring your own meat. What to bring: Warm jacket; hiking boots or shoes; shorts; capris; long pants; long-sleeved shirt; hat or visor; sunscreen, mosquito repellent, journal or notebook; paper; daypack and two water bottles for the hikes; watch; binoculars and a flashlight. Carol Seavey is special sections editor at the Casper Star-Tribune. Contact her at 307-266-0544 or carol.seavey@trib.com. Follow her on twitter at Carol_Seavey.